Prior to becoming a chiropractor, Dr. Redenius acquired his four year degree from Central College majoring in Athletic Training. After passing the state board and becoming licensed, Jeff Redenius became the Head Athletic Trainer for Palmer College's Division I Men's and Women's Rugby Football Clubs. For over three years, Jeff followed the teams across the country to competitions and providing the necessary care to manage the vast amount of injuries that come with the game of rugby. 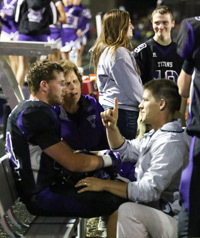 Since his time with Palmer Rugby, Dr. Redenius now provides his athletic training knowledge and care for the South Central Calhoun County Titans. Redenius Chiropractic has a unique factor that most practices do not provide. Being an athletic trainer with the ability to diagnose and manage most athletic injuries on the field allows families to save valued money not sending their athlete to the emergency room when it is not needed. Also, as a chiropractor, Dr. Redenius is able to take X-Rays of the athletes' injury to check that there is not a fracture. However, if there is a fracture, Redenius Chiropractic then refers athlete to a local health care provider that is skilled in addressing acute fractures.